Composed by Johann Sebastian Bach (1685-1750) and Nikolaus Herman. This edition: Paperbound. Hymns by Martin Luther: Ausgaben mit mehreren Luther-Liedern; Choral collections. German title: Bach Chorales. Awake My Heart Single Copy. Hymn settings, Whole church year / Omni tempore, Peace and justice, Morning, midday, evening. Choir Book. 80 pages. Carus Verlag #CV 02.098/10. Published by Carus Verlag (CA.209810). 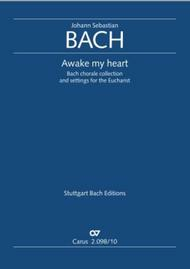 A collection of 68 Bach chorales for the church year with English singing texts. Selection was made of those chorales which either have familiarity and currency in English, or through their strength and beauty deserve to be better known. 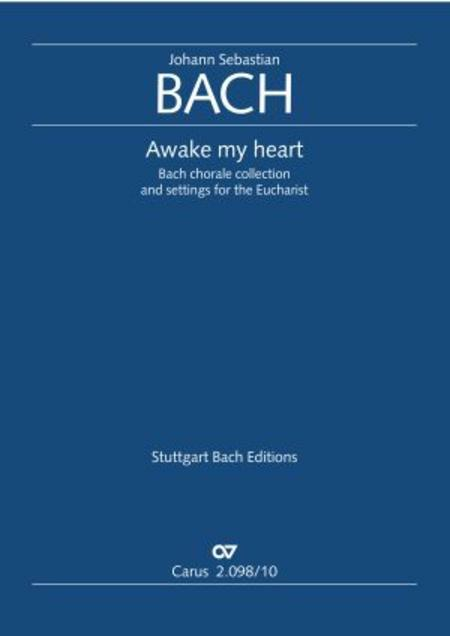 The edition is directed towards use by church, college, and community choirs, who will find here an abundant assortment of anthems and concert material. Score available separately - see item CA.209800.